← And what a wonderful time was had by all………. 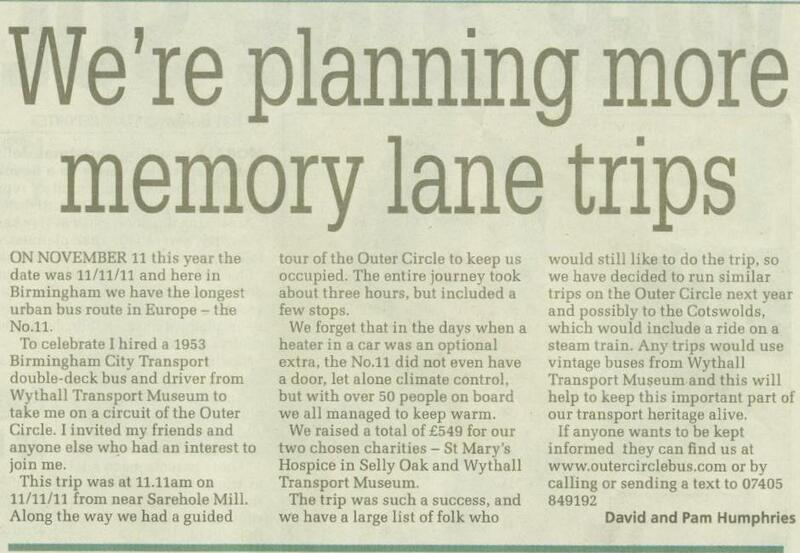 We have had more press coverage and lots of lovely comments (see our comments page here). Our survey indicates that we got most of the day right! Thanks to everyone that responded to the survey, the comments were gratefully received and most useful. There was an item in the Birmingham Mail on the 22nd November. Here it is in all its glory!! This entry was posted in 11-11-11 and tagged 11-11-11, 1950s Birmingham Corporation Double-Decker, Birmingham City Transport, birmingham mail, Outer Circle, Outer Circle Bus. Bookmark the permalink.